If you have ignored previous warnings and your business isn’t taking advantage of responsive web design right now or planning on it in the very near future, you are in danger of going out of business in 2014. 1) You don’t depend on your website to stay in business. 3) You are familiar with responsive design, you’ve already verified it’s not the right fit for you, as Linkedin has, and you have an alternative mobile strategy. If any of these three apply to you, then you’re ok, carry on. But if your company depends on its website enough that losing the business it brings to you would be a serious blow, getting a responsive website before the end of the year should be your #1 online marketing goal. What is Responsive Web Design in a nutshell? Responsive web design is simply this–a website design that adjusts gracefully to fit on desktop, tablet, and smartphone browsers. Like in the example on the right. Making it so that you don’t have to design a different site for every different screen and device in the world. Considering the rate at which the mobile web is growing, it’s becoming crucial that your website be ready to accept visitors who are coming in from a widely assorted array of different devices and screen sizes. Ever pull up a website on your smartphone and it was just a very tiny version of what you would see on your desktop, so you zoomed way in, and then moved the website around and enlarged and shrunk it as needed to read text and click on things? That was not a responsive website. Or if it was, it left out the key point of adjusting “gracefully.” A responsive website looks good no matter whether you’re looking at it on a phone, tablet, or desktop. 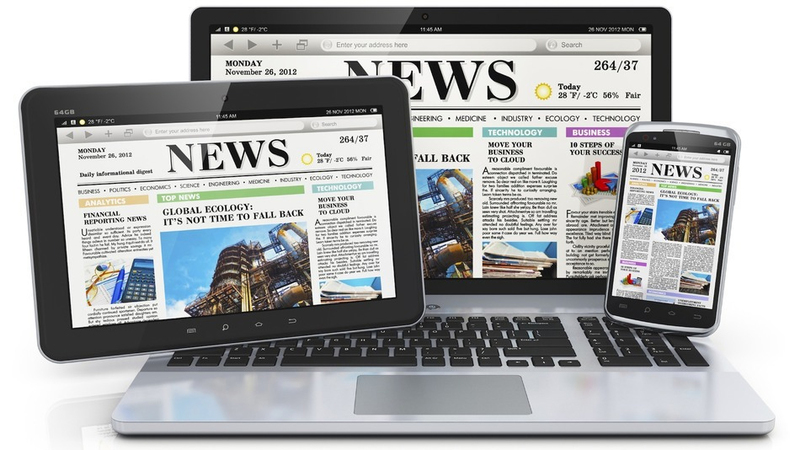 Why is Responsive Web Design important? More people are accessing sites on the go from their mobile phones, tablets or laptops these days. If companies don’t adjust their web design to be responsive to make their sites readable on different devices they could fall behind the current trends. If you are shutting out or providing a sub-par user experience for your users, you’re going to lose out on potential business. 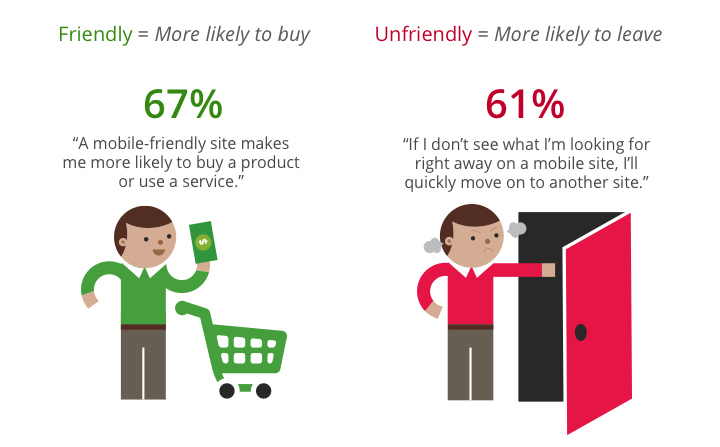 • 65% of users expect websites on mobile devices to be as easy to use as on a desktop computer. • 80% of users won’t leave home without their smartphone. • 50% of users use their mobile to find local restaurants and bars. • Looking at local information on a smartphone, over half of smartphones users take actions such as calling, visiting, or purchasing from that business. 26% go on to purchase something in-store. • Smartphone users are increasingly using their devices to make decisions about what restaurants to go to, what products to purchase, and what businesses to visit. Investing in a responsive, mobile-friendly site helps steer those customers to your business. Your bounce rate depends on it! Every second counts when it comes to bounce rates and conversion goals. Redirecting to m.yoursite.com costs precious time. Research shows that users give up when pages take longer than 5 seconds to load. Other research suggests that shaving a few milliseconds off of your load time can increase conversion rates significantly. In general, responsive pages are served, loaded, and rendered quicker than other mobile experiences. Users want to be able to quickly and easily find basic information about local businesses and restaurants. If they can’t find your hours, if your menu is a huge pdf, or if your site is generally inconvenient to navigate, users will bounce to another site, which means they won’t be visiting you in real life. Straight up, Google is telling us to ditch other methods in favor of responsive design. Using the same URL and content across all devices helps Google index and weight your site. Google masquerades as most of the common mobile devices when crawling your site, and if there are content inconsistencies, you may be penalized. Redirects, such as to mobile-only pages, don’t help either, and can become a trap for endless redirects if not implemented properly. For local businesses, page ranking can be cut-throat. Playing by Google’s rules goes a long way towards leaping ahead of the competition. 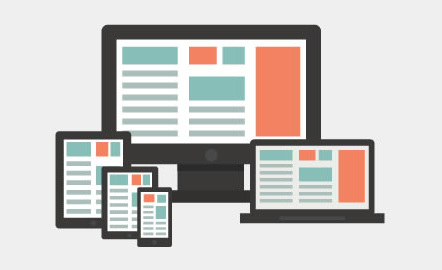 Responsive Design, What Does It Cost? If you have a relatively simple brochure website for your business, modifying your existing website to be responsive design may cost you as little as several hundred dollars to perhaps a few thousand. That is assuming the design lends itself to becoming responsive. But if you haven’t redesigned your website in several years chances are you’ll need to go through a complete redesign process and the answer to what it will cost is, as usual, “it depends.” If you have a vendor you work with you on your website, simply ask them if it’s possible to overhaul your existing website to be responsive, and what it will cost. While going responsive can present challenges for website owners and online marketers, I return to my previous point that without a mobile-friendly website your future online is bleak. If you’re not providing a mobile-friendly experience for your customers, they’ll bounce off your website and go to your Making your website responsive is a small price to pay to reach all these people. If you are interested in a WordPress Responsive Website Design contact us today! Why should a logo cost more than 500 bucks? Helpful Branding Tips for Small Businesses! What Makes a Great Logo Design? 3200 Axford Road, Santa Cruz, CA 95062 | Copyright © 2014 Schafer Design. Theme Designed by Schafer Design.